Packed with fiber, protein and slow-burning carbohydrates, these healthy breakfast ideas will help kids stay alert and engaged throughout the day. A little low-fat dairy and some vitamin-rich fruit and you’ve just started your day right, nutritionally speaking. A smaller cousin of the breakfast burrito, the breakfast taco made with Cheddar, salsa and scrambled eggs is a satisfying and healthy breakfast option. Liven up a boring breakfast by creating faces out of healthy ingredients. Chop up an assortment of vegetables and let the kids make funny faces on a toasted bagel spread with cream cheese. 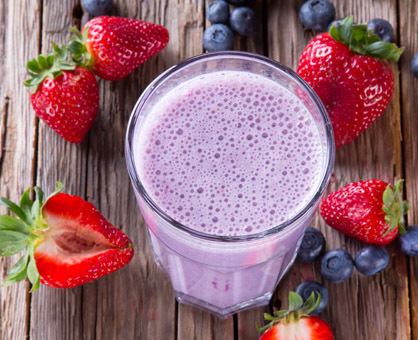 A smoothie is a meal-in-a-glass. Make one with fresh berries and orange juice for a breakfast loaded with healthy carbohydrates and powerful antioxidants. A grab-and-go breakfast: a toasted bagel topped with nut butter and banana slices. It is ready in just five minutes and easy to eat on the run.